The number of crusher types in terms of style and configuration can be more difficult to quantify, as there are lots of ways to customize crushers. However, you’ll find four basic designs – cone, jaw, gyratory, and impact crushers – operating within many crushing plants. Today we’re breaking down everything you need to know about crushers to help you understand the questions you should ask as you search for the right machinery for your operations. It is common to use multiple crusher types within a project and set them up as stations in a circuit format to perform the necessary material reduction work. In many cases, primary, secondary, and tertiary stations are established to reduce the rock to the desired size, shape, and consistency. Of course, not all projects require all the stations or stages – sometimes primary crushing alone may offer enough reduction for your goals. For instance, if the final size of your product only needs to be between 4” and 6”, a primary jaw crusher can accomplish your goals. You will likely require a much finer product, however, and that means incorporating up to three stations including a variety of crusher types. 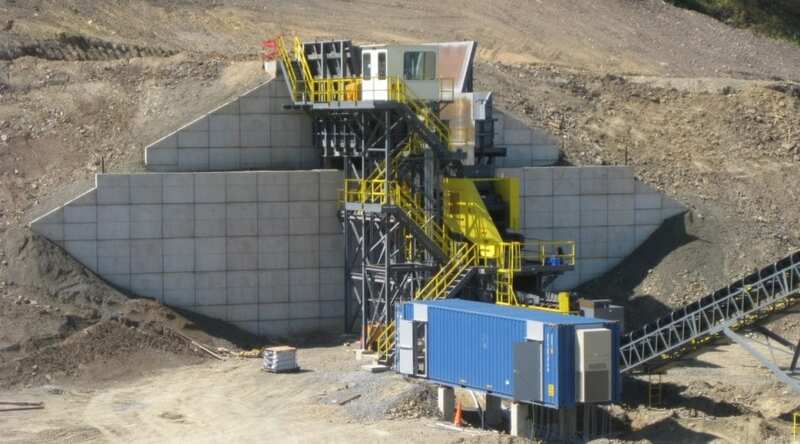 As the first stage in a crushing circuit following extraction from a mine site, (or in the case of recycled asphalt production, delivery to the RAP processing plant via truck transport), primary crushing reduces material to a size and shape that can be handled by the secondary crusher. Typically, the minimum setting on most primary crushers will be about 4”-6”, as noted above. Jaw, impact, and gyratory crushers are most often appropriate as primary crushing equipment types, though there can be overlap between primary and secondary crushers as far as suitable types. In secondary crushing, reduction ratios become an important consideration. Knowing just how fine you need your final output to be, along with the feed requirements of your tertiary crushing station, will help you determine how much reduction needs to take place within this stage. Cone crushers are often placed within the secondary crushing station because they are versatile in terms of feed and discharge openings. With cone crushers, though, it is essential to operate them at consistent settings to keep productivity up. The goal of the tertiary or final reduction stage of the crushing process is to size and shape rock or other material into marketable product. Again, there may be overlap between stages regarding which crusher styles work best between secondary and final reduction crushing. Cone crushers, vertical shaft impactors (VSIs), or even high-pressure grinding roll crushers may be used in the tertiary position. Sandstone, limestone, and granite are arguably the three most common aggregates used in the construction industry today, but these rocks have very different hardness and abrasiveness characteristics. The type of rock you plan to focus on processing in your operation will dictate the types of crushers you’ll need to include in your crushing circuit. Cone crushers (along with jaw crushers) are classified as compression-style crushers, which are typically used with more abrasive and harder materials such as granite. These types of machines reduce materials by squeezing them until they break apart and are very powerful. Cone crushers are also extremely versatile, as we touched on above, and newer generation cone crushers can output a more cubical product similar to impact crushers. In compression crushing, jaw crushers tend to be more of a blunt instrument compared to cone crushers, which is why they’re often used in the primary circuit stage. Jaw crushers are also known as “rock breakers” and are used to break up larger, harder materials into more manageable pieces. They tend to do well with many different types of materials and don’t display as much wear and tear as impact crushers. They also produce minimal fine materials and dust, though the finished product with this type of crusher almost always requires secondary crushing. Gyratory crushers are actually quite similar in concept and design to jaw crushers – both feature a conical head and concave surface (often lined with manganese steel) and break apart material by compression through what is known as eccentric movement. Like jaw crushers, gyratory crushers are often utilized in primary crushing stations, though they may sometimes be used as secondary crushers, as well. Impact-style crushers include VSIs, as well as horizontal shaft impactors (HSIs), and are best used with less abrasive rock types, like limestone. These types of machines break apart material by throwing it into an anvil or by striking it with a blow bar. Some operations also use impact-style crushers after they have already used a different type of crusher that produces a more elongated stone. This helps further shape the crushed material into a finer consistency with a more cubical nature. Impact crushers tend to be less expensive than compression crushers (aka cone and jaw crushers) and have a higher reduction ratio. They can also break sedimentary deposit-type rocks, like limestone, along natural lines, which rounds off sharp angles and weak edges. This produces an end result that is more sand-like in nature. Drawbacks of impact crushers include their tendency to produce an excess of fine materials if used with softer rocks. Impact crushers can also require frequent part changes and can create a large amount of dust that can be an issue on some worksites. Depending on the length of your project and how mobile your crushing equipment needs to be, you can choose either stationary or portable/modular crushing plants. Stationary plants are often preferred because they feature a higher capacity and efficiency and lower production costs with easier maintenance. They also have a lower energy cost if you have electricity on-site and no additional equipment is needed to move them from place to place. However, if you need to move your rock-crushing plant more than once a year to multiple job sites, you may be better off investing in portable equipment. These self-contained plants are better suited to smaller projects and can be moved from project to project as necessary. They are not as efficient and have less capacity than stationary plants, but they can be more cost-effective in the long run if you have multiple projects in different areas. Here at Kemper Equipment, we offer the best performing crushers that will work hard to make any finished products you plan to produce, including sand, gravel, fertilizer, specialty mineral products, recycled asphalt, salt, coal, and slag. Contact us today to discover how we can provide a custom-designed crushing circuit or retrofit a new crusher into your existing operation.